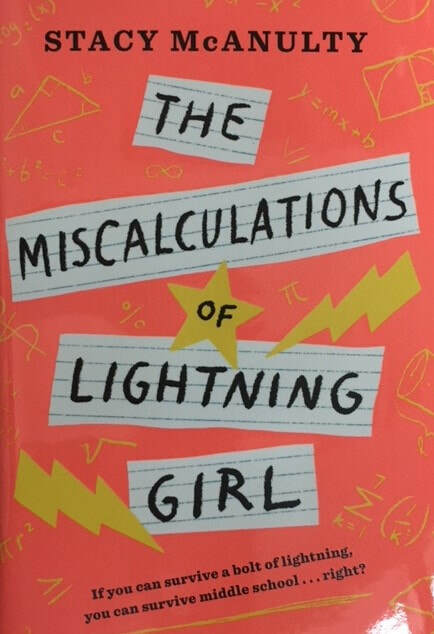 After Lucy was struck by lightning, she was able to calculate complex math problems in her head, and to see numerical patterns easily. She is so advanced that she spends her free time solving difficult math problems in an online math chat room, and she begs her grandmother to let her attend college courses. Unfortunately, her grandmother has other ideas. Instead of continuing her homeschooling program, Lucy will go to a regular middle school. Lucy has a few OCD traits that make her stand out, so she decides she won't reveal her math genius to anyone at the school. Her new friend, Windy (with an i), is enthusiastic about everything, but especially about the community service project they're all required to do. Lucy is pretty sure this is a waste of her time, and that no one except her online math friends (who don't actually ever see her) will ever see her as anything but a freak. I love Lucy's quirky mindset, and her journey to figure out how she can be herself around people who are not exactly like she is. I also appreciate that her friends - even the mean girl - have their own journeys. Her friend Levi, who isn't great at school, is pretty great at helping people without making a big deal out of it. Windy is all about the feelings and making the world a better place and doing everything to the millionth power. Lucy herself is a math genius, but she isn't a robot - she has worries and hopes and makes mistakes. Her OCD isn't the focus of the story, either; it's just a part of herself that she manages. Lucy also applies her talents in a way that ultimately helps others, instead of just being shown to be unusually good at an academic subject. Lucy's nontraditional family - she lives with her grandmother and has the support of her uncle when he visits - is a matter-of-fact part of the story. Plus, this book is funny and likely to make you cry in places, which is a lovely combination. Resource: The author's page for this book has links to related concepts about the book, including mathematical problems and ideas. I don't mean whatever. There are plenty of things that I would never do. Like share a fork or eat in a restaurant with a sanitation grade lower than A."